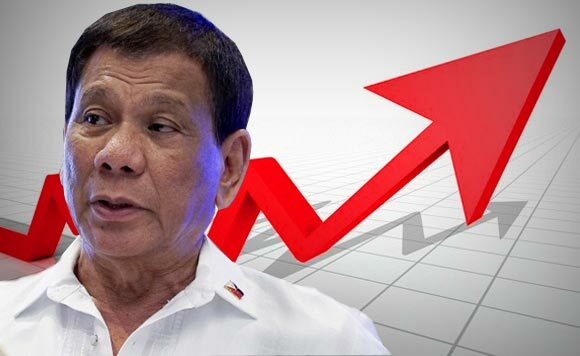 MANILA -- President Rodrigo Duterte’s net satisfaction rating has recovered to “very good” in the third quarter from its record-low “good” in the second quarter, a Social Weather Stations (SWS) report showed on Saturday. In the survey conducted from Sept. 15 to 23, the SWS found that 70 percent of Filipinos were satisfied with Duterte’s performance as President, 16 percent were dissatisfied, while 14 percent were undecided. Gross satisfaction with Duterte’s performance improved by five points from 65 percent, gross dissatisfaction fell by four points from 20 percent, and gross undecided decreased by one point from 15 percent. According to the survey, Duterte has a net satisfaction rating of +54, which is classified by SWS as "very good". It also marks a nine-point increase, and one grade up, from his personal record-low of “good” +45 in June. The survey cited the 9-point rise in Duterte's net satisfaction rating to increases of 16 points in Balance Luzon, two points in the Visayas, one point in Metro Manila, and one point in Mindanao. His net satisfaction rating stayed “good” in Balance Luzon, at +49 in September or up by 16 points from +33 in June; it stayed “good” in the Visayas, at +49 in September or up by two points from +47 in June; and it stayed “good” in Metro Manila, at +36 in September, up by one point from +34 in June. Duterte’s net satisfaction rating, however, stayed “excellent” in Mindanao, at +77 in September, up by one point from +76 in June. Among the classes, the President's net satisfaction rating rose from “good” to “very good” in class D or the masa, at +56 in September, up by 13 points from +43 in June 2018. However, it fell from “very good” to “good” in class ABC, at +41 in September, down by 25 points from +66 in June. It also fell from “very good” to “good” in class E, at +45 in September, down by seven points from +52 in June.